When was the last time you TRULY had a good night's sleep? I can honestly say that I was one of those people who thought a mattress was nothing more than well....a mattress. It never crossed through my mind that not all mattresses are the same; and I found this the hard way. Esmirna and I have lived together for more than 6 years and our mattress happened to be my old mattress from back home, (hi mom!) For as long as I can remember "sleeping" in our old mattress consisted of tossing, turning, and falling asleep after a few hours of trying to find the right position. This all changed thanks to The Azza Mattress. Let's just say swapping our mattress for a THE AZZA MATTRESS was like night and day (pun intended). We got our hands on a Queen-Sized Azza Mattress; not only was shipping fast (and it is made in the US of A), but this fluffy bundle of joy came packed up in a neat ol' purple box. It took me a minute or so to take the mattress out of its box; the mattress began to take its full shape as I unwrapped the mattress on top of my bed frame. Before I knew it the mattress was all ready to go! The top features a soft and removable cover in white along with an awesome "ZZ" Signature logo all across. A 6" high density base is set in place to ensure a strong and sturdy mattress for years to come. On top, a 2" base of memory foam will give you the exact amount of firmness. This layer is IDEAL for those facing chronic back pain, arthritis, or joint problems. The cherry on top: Azza's top features a unique Dual Phase Change Gel that acts as a temperature regulator to create the perfect sleeping temperature, no matter how many sheets or covers you have on top or below you! If you're ready for a future full of good night's sleep then make the change to The Azza Mattress by clicking here! Try it for 200 nights and if you don't fall in love with this AWESOME mattress (and I know you will) Azza will pick it up and refund 100% of your money spent. A "hashtag goals" bed would not be complete with a complete bedding set from BlueBellGray, available exclusively at Macy's. The boho-and-carefree-inspired bedding adds a clean, crisp, and comfortable touch to our new bed, and room. 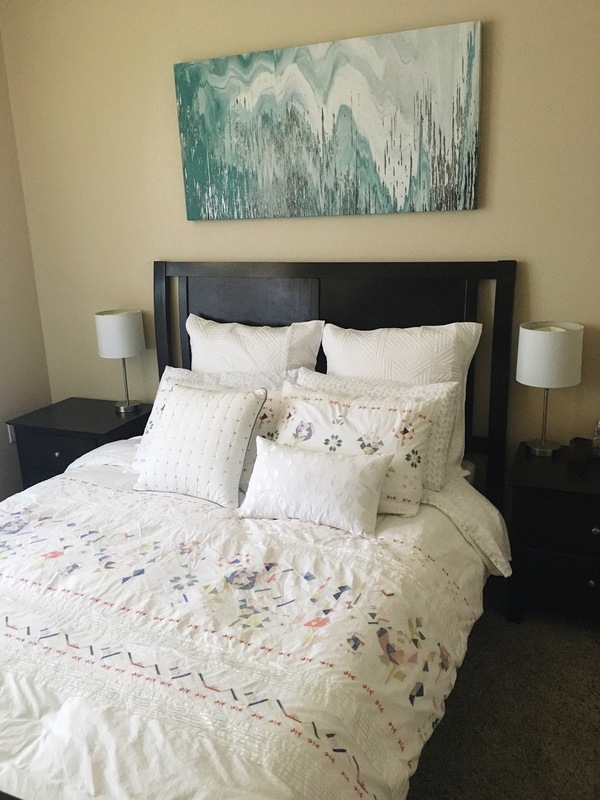 Combining our new Azza Mattress along with BlueBellGray's Kalkan Embroidered Bedding Collection was by far the best decision we made...not only does our room feel brighter but I've been using this bed to snap pics for my Instagram and Snapchat! Check out a small clip we did for both BlueBellGray and Azza; we hope you enjoy it as much as we enjoyed filming it! The idea needed us a few minutes possibly even to look at your bedding beyond their field; your bedding did start to get their entire design when i unwrapped your bedding in addition to our bed frame. It is a best bedroom mattress for good night sleeps, It is looking too cool with design, heavy in size and also comfortable. Get the offers of Memory Foam Mattress for sleeping at affordable price.